Sudanese Actions of Revolution to Shift Methods! Sudanese Actions to Shift Towards Revolutionary Actions! The Sudanese Actions taken to setup the Sudanese revolution are not good enough and they will never achieve any victory to the Sudanese uprising. The actions lack the right mechanisms in place to conquer the fundamental religious military regime. The regime of what's called the National Congress Party headed by the international criminal Omar al Bashir isn't just like any totalitarian regime to oust by using a calssical Sudanese intifada, as before. This bloody regime requires other revolutionary methods. hoa-politicalscene.com/sudanese-actions.html: Sudanese Actions: إجراءات سودانية سياسية. 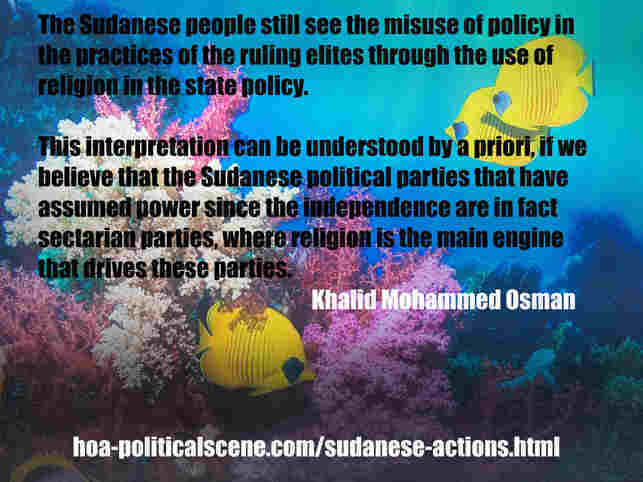 Khalid Mohammed Osman's political sayings in English 1. أقوال سياسية لخالد محمد عثمان بالانجليزية. Since the early days of the Sudanese protests, I am still saying there's no way to get rid of this regime and to eliminate all of the political powers, which caused the political problems in Sudan and caused the deterioration and wars in Sudan, until we shift the way of the Sudanese rising and use new revolutionary mechanisms. The political parties, I mean here are the Sudanese political parties and above them are the Sudanese Sectarian parties and the parties of the Muslim Brothers in Sudan, like the one that's called national congress thing and the People's Conference Party. The two are political parties fabricated by the National Islamic Front (NIF). The mentioned parties in this context are all function with religious beliefs to use region in the policies of the state and we know for sure this usage of religion in politics has been the main cause of deterioration in Sudan. It's the cause of making Sudan two (Sudans). Shifting the Sudanese Actions in the Sudanese protests is better to achieve success to the revolution. The shift could possibly be by making every active person in the revolution real Sudanese tiger. Then we should all be real revolutionists in Annumor AlSudanyah to think together on the best methods to use to implement new revolutionary mechanisms. Well, to get deeper into this, please follow all the sections of the page, along with the links associated with it, the intro and the insights on why we need the shift. Intro to Index 5, Episode 5: Sudanese Actions! This is episode 5 of a new sequence of Sudanese political articles in English and Sudanese Arabic political articles written in articles and commentaries by me and the readers of the HOA Political Scene Newsletter. The sequence comes including many episodes. We have more than 200 episodes until now. You need to follow the other episodes published prior to episode 5 and then continue to the other episodes. Episode 1 is at Sudanese Abilities. Episode 2 is at Sudanese Absence. Episode 3 is at Sudanese Abuse. Episode 4 is at Sudanese Achievements. As episode 5 is here on this page, so episode 6 is at Sudanese Activities, episode 7 is at Sudanese Administration, episode 8 is at Sudanese Advantages, episode 9 is at Sudanese Adversity and episode 10 is at Sudanese Advices. I am still working hard in the organization of the sequence alphabetically and numerically. So, if you did find any episode not filled in, just come back after some days and you'll find it in place. hoa-politicalscene.com/sudanese-actions.html: Sudanese Actions: اعمال سودانية سياسية. Khalid Mohammed Osman's political sayings in English 2. أقوال سياسية لخالد محمد عثمان بالانجليزية. Sudanese Actions to Shift Revolution Mechanisms! The Sudanese ongoing activities to eradicate the totalitarian regime in Sudan are not enough to win the national political struggle against the Sudanese military-religious system. These political activities began against the NCP regime since the first year after the takeover of power by members of the NIF in the Sudanese army in 1989. There have been popular Sudanese demonstrations that continue until this moment against the Sudanese dictatorship, and there have been military movements to eliminate it too. But all these attempts have not succeeded so far. Although the Sudanese uprising is still ongoing, it has not been able to achieve any victory over the Sudanese totalitarian regime. This continuous failure of the Sudanese revolution calls for a reconsideration of the political activities against this regime, to discover the reasons that lead to the failure of the Sudanese protests against the policies of the religious dictatorship. With the careful follow-up of the Sudanese Revolution movement since its outbreak against this regime, we believe that the factions and sectors of the Sudanese people involved in the Sudanese uprisings are not stable on a single unified approach and are not based on common, unified resolutions. Not only that, but the popular sectors involved in the Sudanese revolution against the dictator Omar al-Bashir and his Chauvinist regime have different agendas and goals related to the gains of each sector involved in the revolution. In other words, these sectors have their own interests. This means that the revolution can not succeed, as long as its revolutionary sectors have different interests and political orientations. There is, of course, a revolutionary sector that clearly sees the issue. This revolutionary sector sees the reasons for the failure of the Sudan's ongoing revolution. It believes that the Sudanese revolution must take another different approach in the face of this bloody regime. This revolutionary sector may be less influential than other revolutionary sectors. Therefore, this revolutionary sector is unable to obtain a revolutionary consensus in favor of what it deems appropriate for the Sudanese revolution. There seems to be a problem in this regard, namely, that many of the participants in the Sudanese political events against the Sudanese regime are members of Sudanese political parties. Members of the Sudanese sectarian parties, naturally, do not want any change in the nature of their activities against the regime, they continue to say what other political parties say as that the Sudanese revolution must be a peaceful revolution against the regime. These Sudanese political parties, as they say the revolution should be peaceful, naturally do not want to use political violence in the Sudanese struggle. That's not because they do not want violence, but because they fear the growing strength of the young revolutionary youth people who do not belong to these parties. They afraid of losing their power and influence and political interests if the young people succeeded with new revolutionary ideas. hoa-politicalscene.com/sudanese-actions.html: Sudanese Actions: إتخاذ إجراءات سودانية. Khalid Mohammed Osman's political sayings in English 3. أقوال سياسية لخالد محمد عثمان بالانجليزية. They even have influenced some of the Sudanese revolutionary youth to get into that political orientation too. These parties, however, continue to maintain their perspectives indicating that they are the sole representative of the Sudanese people. 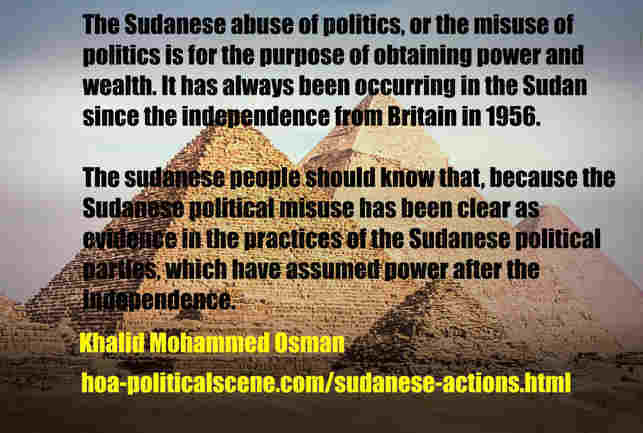 They think that there is no other alternative to assume political power in Sudan except them. These parties believe that the members of the (revolutionary Sudanese youth movement for change) lack the political expertise required to manage a multi-cultural state like Sudan. They do not care about the Sudanese youth and they do not want the Sudanese youth to win. So, these parties are afraid that they will not reach the political power, if the young Sudanese movement succeeded. Their insistence on peaceful Sudanese demonstrations against the regime of Omar al-Bashir is in fact serving the dictatorial regime. At a time when these Sudanese political parties are participating in the demonstrations and seeking to lead them, they are at the same time working with the regime on the pretext of finding appropriate solutions to the Sudanese political crisis, so as to impose themselves on power again. For all of this, which has been given the spotlight on many of my speeches to the Sudan People's Resistance Movement, I am the Sudanese journalist Khaled Mohamed Osman, I still say that the mechanisms of the Sudanese uprising must be changed, meaning that the methods of the Sudanese revolution must be changed. No revolution can be a real revolution if it is peaceful. I have been calling for the change of the Sudanese revolutionary methods and for the correct understanding of the Sudanese political crisis since the days of Nimeiri. I am still standing here in this field of my political opinions, since the failure of the July military corrective movement, which was carried out by members of the Communist Party of the Sudan to change the regime of dictator Jafar al-Nimeiri. The leaders of July 1971 movement were Nimeiri's colleagues in the Sudanese Revolution Council, when they achieved the military coup in May 1969. It is very important to change the methods of the Sudanese revolution, if we really want to eliminate the totalitarian regime and ensure that the Sudanese sectarian parties do not have access to power again. These sectarian parties have been in power since the independence of the Sudan and have not provided any solutions to the political problems in Sudan. They have contributed directly to those problems, contributed to the continued deterioration of the Sudan and contributed to the success of the military coups. With a thoroughly review of the history of these Sudanese political parties, we will see all of this. When we say changing the methods of revolution, it means introducing revolutionary modern tactics. The introduction of such methods must be carefully carried out in a real revolutionary group, to work in the short and long terms patiently to broaden its own grassroots and then it must fully prepare all the requirements of the true revolution. The Sudanese actions we need urgently could be developed at Annumor AlSudanyah. We do need to have people with the same political vision to achieve modern, secular and united state in Sudan. hoa-politicalscene.com/sudanese-actions.html: Sudanese Actions: فعاليات سياسية سودانية. Khalid Mohammed Osman's political sayings in Arabic language. أقوال سياسية لخالد محمد عثمان. Thinking of Other Sudanese Actions? Did you find the Sudanese Actions useful? Do you think of any other Sudanese Actions? Why not tell us about all of that? 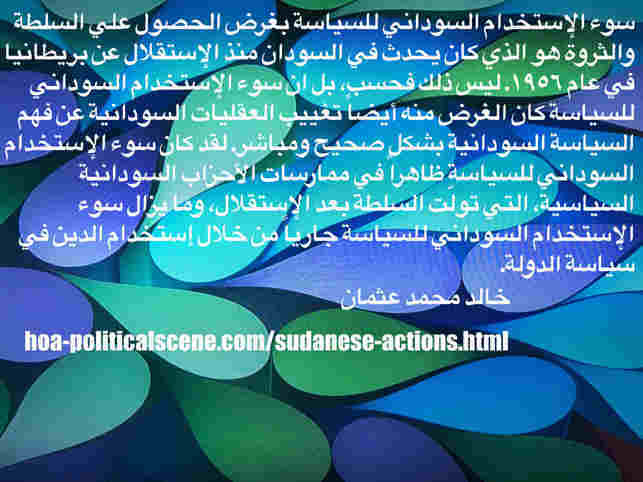 You can also comment on the Sudanese political actions we need to achieve real revolution in Sudan. Use the Comment C2 Entries form to answer the question, comment, or write about Sudan. Your comments will add values to the "Sudan Online" platform. In addition to Sudanese Actions and the Sudanese issues you read, you might be interested in some documentary movies about Sudan. You can watch all of that on documentary film at TVCinemaApp.com. 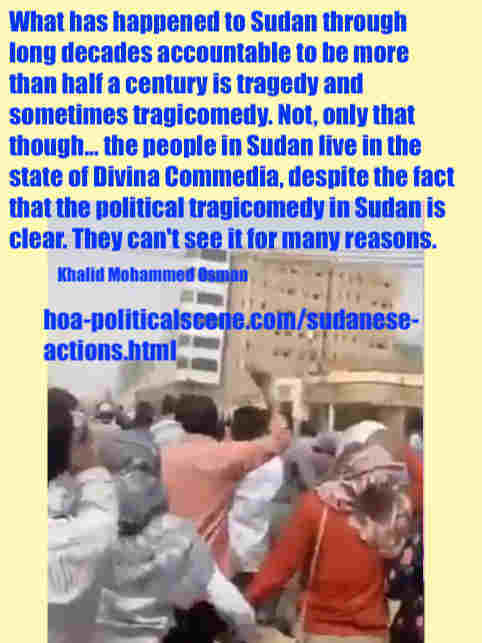 Political comments on Sudanese Actions, or new entries on Sudanese issues appear at the section of the page below the comment form. If you didn't comment, or write about any issue in Sudan, please do that now. Thanks.